Copying domain (and only domain) between Esri geodatabases? 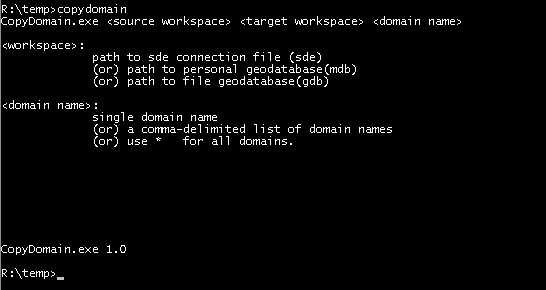 Sometimes I have the need to copy a domain(s) from one geodatabase to another (without the featureclass or table). In the past, I have accomplished this in a few different ways, but each method is not as straightforward as I think it could be (or maybe there's a CopyDomain tool that I've missed). What method do you use to accomplish this? This is an ArcCatalog Extension that allows you to copy domains between geodatabases. I believe it is only up to date for 9.3.1 SP1, so it may not work with ArcGIS 10. For coded value domains, I'll do a Domain To Table from the source geodatabase and then do a Table To Domain into the new geodatabase. I don't know of a way to this for the range domains. You can do a Domain To Table, but the Table To Domain always comes in as a coded value domain. This method is more hacky and only practical for 1 or a few domains. In the original geodatabase, create a dummy featureclass with a dummy field that matches the field data type of the domain that you wish to copy. Copy/Paste the dummy featureclass into the new geodatabase and don't delete it until you've assigned the domain to a field in another featureclass. I wrote a quick command line arcobjects exe based on some vba code that I found last week. It's not complicated code. Fine print: The exe is compiled to 10.0 / ArcEditor license (the license is part is hard-coded for now). 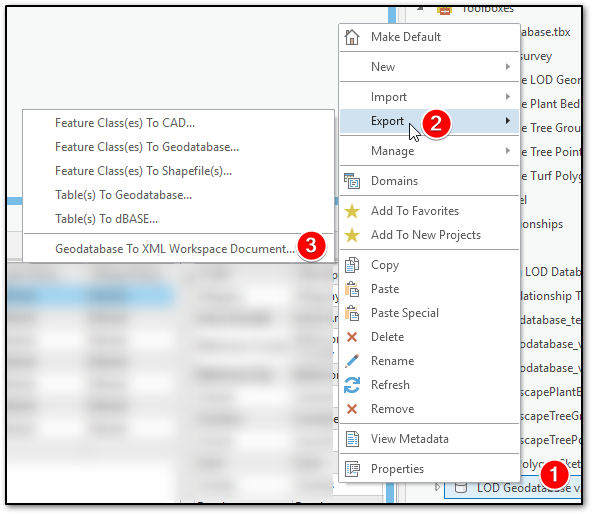 Here's a method to export/import domains that uses XML Workspace Documents. 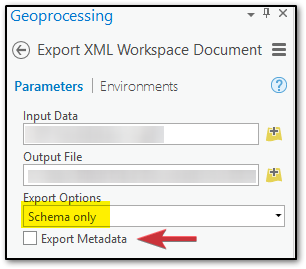 Export the schema only. Metadata is optional (red arrow). The dataset schema is deleted in the step. (optional) Turn on word wrap to make everything easier to see. Select the edited XML and go. The Esri XML workspace specification is very specific. If the import step gives an error, there is probably a schema error. Review the XML or just export it again and repeat. Don't remove any extra carets or line breaks. Not the answer you're looking for? Browse other questions tagged arcgis-desktop esri-geodatabase domains or ask your own question. Importing/copying geodatabase schema from multiple tables to single table? Select by Location in ArcGIS with numerous polygons? Copying Domain and Subtype from File Geodatabase? Why is ArcGIS Tabulate Area Better to Calculate Unique Landuse Values in Zone?